Telangana DSE and Ex-Officio SPD has released a notification for recruitment of Sepecial Officers (SOs) and Contract Residential Teachers (CRTs) in 84 new KGBVs and 29 Urban Residential Schools (URS). Who have successfully submitted the online application the candidates can download the TS KGBV Exam Admit Card from the official website. TS KGBV/ URS Exam will be conducted on schedule date at various centers. A huge number of candidates applied for this examination.TS KGBV/ URS examination schedule to be held on 17.06.2017 and 18.06.2017 is postponed to 22.06.2017 and 24.06.2017 respectively and inform to candidates accordingly at their level. 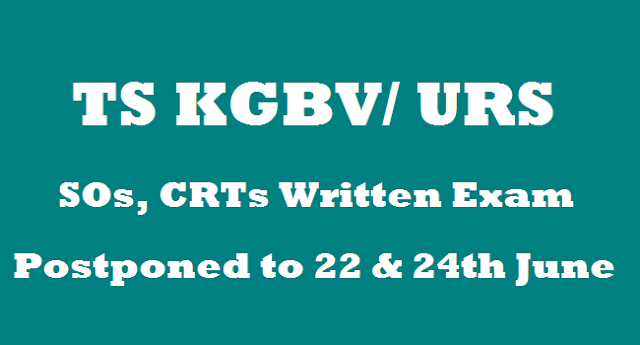 Sub:- TSSA - Written Test for recruitment of SOs & CRTs in KGBV and URS - Certain Instructions - Issued - Reg. Ref:- 1. SPD Proc.No.2458/T9/SSA/KGBY/17, Dt. 09.06.2017. All the DEO & E.O, DPO,SSA in the State are informed to follow the guidelines mentioned hereunder with regard to conduct of Written Test for recruitment of SOs & CRTs in KGBV and URS. The said examination schedule to be held on 17.06.2017 and 18.06.2017 is postponed to 22.06.2017 and 24.06.2017 respectively and inform to candidates accordingly at their level. Constitute examination centres and deployment of personnel for smooth conduct of examination with the approval of the District Collector and issue necessary orders to the concerned well in advance. The DEO concerned shall issue Hall Tickets to the candidates who have submitted application form along with certificates for verification. "They are provisionally permitted to write the examination and selection will be done only on merit, submission of TET, qualification certificates required for the applied post, Bonafide certificate (from 4th to 10th class) and other requisite certificates as per norms". The question paper indent for KGBV and URS, post-wise, date-wise, subject-wise and medium-wise separately should be sent to this office through mail (signed scanned copy) before 4.00 P.M on 15.06.2017 without fail, so as to enable this office to supply required no. of question papers to the Districts. One responsible officer with authorisation of DEO should be deputed to 0/o.Director, Government Exams, Abids, Hyd. to receive the question papers and answer booklets on 20.06.2017 by I I A.M without fail and deposit same in the strong room jointly with ORO & DEO under proper security arrangements. Immediately after conducting of each examination the DEOs should receive sealed answer scripts bundles and handover to the Director, Government Examinations through the responsible officer along with attendance and absentee statements.